LaGuardia Airport (LGA) is one of the three major airports serving the New York City region, along with John F. Kennedy International Airport in Queens and Newark Liberty International Airport in New Jersey. Each day LaGuardia welcomes thousands of passengers arriving in ​New York and departing to cities throughout the United States and some international destinations. About 14.5 million passengers went through LGA during just the first half of 2018. Location: LaGuardia is in northern Queens, on Flushing and Bowery bays, in the East Elmhurst section of Queens and borders Astoria and Jackson Heights. 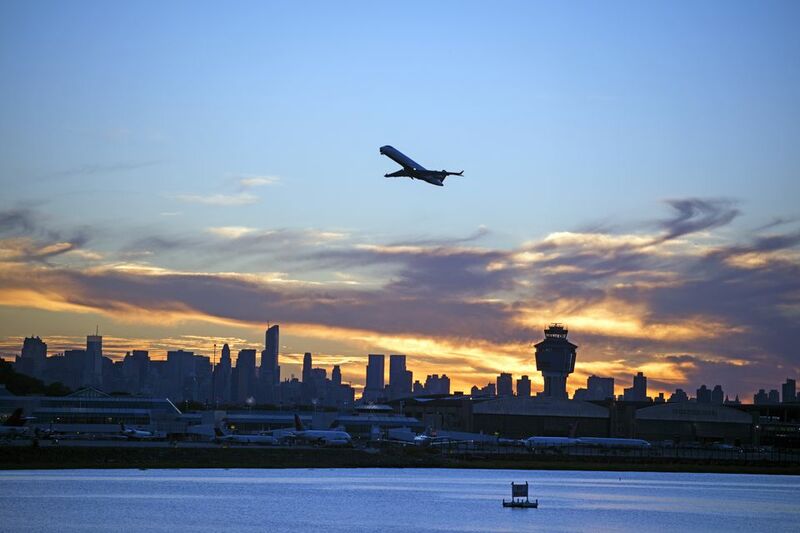 It's the closest airport to Midtown Manhattan at just eight miles away. Tracking information: You can track flights as well as departures and arrivals. The airport has four separate terminals: A, B, C, and D. Terminal B has four concourses and is the largest terminal. Construction on the airport began in 2016 and is scheduled to be completed around 2022 with major projects being completed throughout that time. For example, Terminal B is in the midst of major remodeling, but Concourse B within the terminal opened in December 2018, and the parking garage opened earlier in the year. Check the map at LaGuardia's website for full layout information and updates to the airport. Here are the airlines that fly to LaGuardia and the terminals from which they operate. There are parking lots for short- and long-term parking at LGA, along with several private parking facilities. Shuttle buses connect passengers between the terminals and the parking lot. Here's a breakdown of the current parking options, but check the website for updated information on parking; construction at the airport has caused the temporary closure of various lots. Terminal A: There is an uncovered lot closest to this terminal. Premium parking spaces here require advance booking online. The lot does not accept cash or E-ZPass Plus. Terminal B: Use the newly built garage across the street from the terminal. You can use E-ZPass here when you're exiting, or to pay cash, use the pay-on-foot machines. Terminals C and D: Use the closest covered parking lot. Premium parking spaces here require advance booking online. You can use E-ZPass here when you're exiting, or to pay cash, use the pay-on-foot machines. The B wait area near terminal A allows the first three hours for free—drivers must stay in their cars. Long-term parking: If you need to park at LaGuardia for more than 30 days, call (718) 533-3850. They'll need your name, license plate number and the estimated number of days you'll be parking at the airport. Take the Grand Central Parkway to Exit 6 for Terminal B and Exit 7 for Terminals C and D. Take Exit 5 to Terminal A. (During construction, LaGuardia suggests you do not try to drive to the airport.) Always check the website for updated information. The cheapest way to get to and from LaGuardia is by public transportation unless a friend or family member drops you off. But to get to the airport, you must take the subway, Long Island Rail Road, or Metro-North Railroad to connect to one of several buses that will take you to the terminals. You can catch the M60 at stops in northern Manhattan or Queens to get to all four terminals. From other boroughs, you can take the subway to connect with this bus at any one of its stops. The Q47 bus runs to Terminal A only at the airport. Take the subway to connect with this bus in Jackson Heights, Queens. A one-way trip on the bus or subway cost $2.75 as of December 2018. You can get a MetroCard that's valid for the bus or subway, at vending machines located within subway stations. If you're leaving the airport, there are vending machines for you to get a Metro Card located inside the airport near exits. Fares to Manhattan from LaGuardia (and vice-versa) are metered. Expect to pay a minimum of $45, including tip and tolls. If there is traffic, the fare can rise significantly. Those who want to catch an Uber, Lyft, or similar service can do so curbside at the passenger pickup locations of terminals A, C, and D. However, for those landing at Terminal B, when you exit the terminal, you'll need to walk to Level 2 of the new nearby parking garage (across the street from the terminal) to catch your ride—drivers of rideshare services wait inside the garage and pick up all their riders on Level 2. Here are the best places to grab food and drinks throughout the airport. LaGuardia is the closest of the area's three major airports to Midtown Manhattan, so depending on how long your layover is, you can possibly spend a few hours or the day exploring the city and sightseeing. With no traffic, the drive from LaGuardia to Midtown Manhattan is about 25-30 minutes—of course, there is usually at least some traffic in New York City, so budget for longer. To get into the city on public transportation takes about 45 minutes. If you don't want to venture all the way into the city, the neighborhoods surrounding the airport in Queens also offer plenty to do for a fun layover. Jackson Heights, Woodside, and Astoria, all reachable by bus from the airport, are known for their great food scenes and several other attractions such as parks, museums, and more. The airport originally named the New York City Municipal Airport, changed its name to honor NYC Mayor Fiorello H. LaGuardia upon his death in 1947. There is free Wi-Fi available throughout the airport. The network is "_Free LGA WiFi." Everything you need to know about John F. Kennedy International Airport.